The descendants of founding father Hans Grohe have carefully nurtured and developed the systems which the Black Forest shower and mixer manufacturer brought to the world back in 1901. However, only when this traditional expert knowledge was combined with modern inventive genius were the foundations laid for a company whose success would extend far into the future. 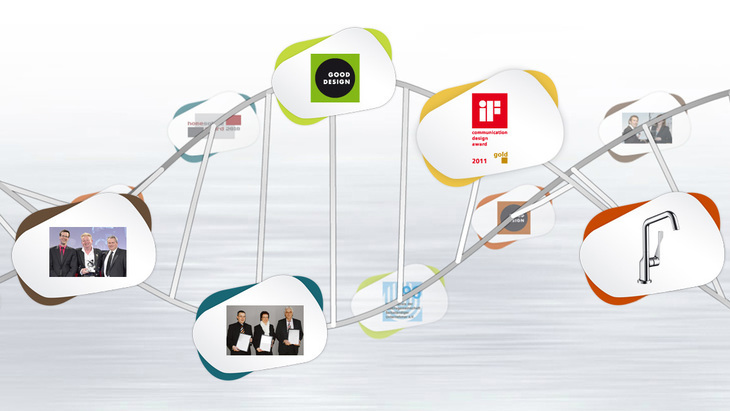 Whether you are interested in the International Forum Design Award, the Axia Award or Focus Green Award: on our interactive DNA strand you will discover numerous awards that Hansgrohe has won. For outstanding product design, environmentally friendly technologies or innovative strength. For initiatives to do with demographic change, social commitment or low-emission production. For communication, fair management or good partnership.